Disney Finding Dory Room-in-a-Box Just $99! Down From $140! You are here: Home / Great Deals / Disney Finding Dory Room-in-a-Box Just $99! Down From $140! Right now you can get this Disney Finding Dory Room-in-a-Box for just $99 (Reg. $140) at Walmart! Transform your little one’s room into their own underwater world with this Disney Finding Dory Room-in-a-Box with Bonus Chair from Delta Children. Boasting colorful graphics of everyone’s favorite fish, Dory and Nemo, it includes a toddler bed with attached guardrails, a toy organizer with six fabric bins, an art desk with paper roll and dry erase top, plus a director’s chair. 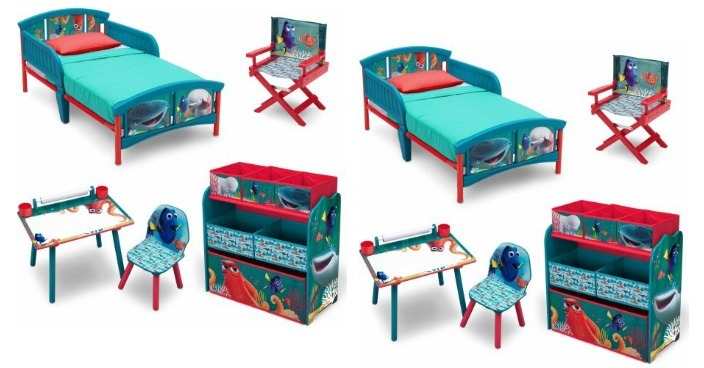 Creating separate spaces for sleep, play and schoolwork, this sweet five-piece set will make any Finding Dory fan happy.